The flood of unfamiliar boating terms can be confusing at first and so to help ease the pressure we present a guide to some basic canal boat terminology. The main body of the boat, excluding the cabin, is known as the hull. The back of the boat is either the aft or the stern, while the front is either the bow, or the forward or fore-end. Amidships refers to the central part of the boat. The bilge is the space at the bottom of the boat inside the hull – water from which can be cleaned out with the aid of a bilge pump. It lies beneath the level of the port (a boat’s left side) and starboard (right side) bilge lines. The swim is the aft underwater part of the hull that tapers into a point to allow a cleaner flow of water over the propeller. The counter is the round, flat stern deck area below the water line and above the swim. The gunwale is the top edge of the hull where it joins the cabin side. 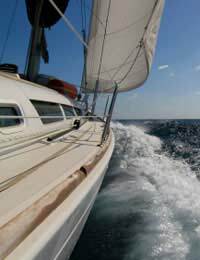 With regards to the sizing of the boat, the air draft refers to the height of the vessel out of the water, from the water line up to the vessel’s highest fixed part, whereas the draught is the opposite, meaning the maximum underwater depth of a vessel, typically measured from underneath the rudder, at the skeg (a steel horizontal bar welded to the base) to the water line. The beam is the boat’s width. When two narrowboats are moored together side-by-side, they are breasted up, and can be referred to as a breasted pair. If you see a narrowboat without an engine being towed behind or alongside a narrowboat as a cargo transported, this is known as a butty boat. The cockpit is the open recessed area at the back or middle of the boat from which the vessel is helmed. The berth could either refer to a boat’s bunk or bed, or the space occupied by the whole vessel when docked. The deckhead is the cabin ceiling, while bulkheads refer to the upright panels or walls that separate a boat into compartments. The galley is the boat’s kitchen. Together with an able-bodied helmsman, the rudder and tiller help to steer the vessel. The rudder blade is submerged at the back of the boat and controlled by the tiller bar, which is a lever connected via an S-shaped steel bar known as a swan’s neck, and which the operator pushes in order to steer the vessel. The actual power required to move the vessel is provided by the propeller known as the screw. Stern gear is a collective term that refers to the propeller, propeller shaft, stern tube (cast steel cylinder that supports the propeller), and stern gland (an adjustable gland designed to help keep water out of the engine space bilge). Deck equipment is a collective term for the boat-hook, shaft, gangplank, ladder etc. Navigation lights are required for travelling at night or in poor visibility to show other boats where you are and what direction you are moving in. A tunnel light is a large beam, like a car headlight, used in tunnels to navigate and warn on-coming vessels. There are two broad types of mooring – offline and online. Online moorings refer to those along the canal – also known as linear moorings – and offline moorings are those off the canal, in a basin or a marina for example. A winding hole is an area on the water wide enough to be able to turn the boat around, a process known as winding. Lift bridges are those structures that need to be lifted in order for a boat to pass underneath. They can be operated manually, mechanically or electronically. The lock is a clever device for allowing boats to pass between bodies of water with differing water levels. Where there is more than one lock in succession, this is known as a staircase lock. Locks are operated with the aid of lock gates, which let a boat into and out of a lock and control the movement of water, and paddles (or sluice). These are the wooden trapdoors set within the lock gate or side of the lock wall, which are raised or lowered to let water in and out of the lock. The operation of lock paddles is controlled with the windlass, an L-shaped spanner-like tool carried by boaters. It is also known now as a lock key.